Wrapped up in a coat of goodness! Last night I was thinking, “You know what would be awesome? If I had a red coat.” Imagine my joy when I logged in today and this pretty popped into my inventory! From FIR & MNA, the Dorset coat is just pure goodness! I love that it goes just below my hips, making this little cutie very versatile. With double buttons on the front and a nice plaid lining, you can’t help but just adore this coat! I’m wearing, of course, the women’s version but there is a matching male Dorset coat as well! Lots of colors, too, so you will naturally want to get all of them to match your outfits. There will be a charcoal version available at FIR & MNA for this week’s 50L Friday, so be sure to pick it up! And I’d be a sad panda if I didn’t mention that this week’s Truth releases are just adorable as can be! I’m wearing Tara, a really high, thick, luscious ponytail. If my hair was this thick and gorgeous for real, I’d be one happy, happy girl. No more reading. Go shop! Do you eat Autumn Mix around this time of year? It’s a bag of candy corn, but it’s got more in it – like big sugary pumpkins. Love it! Why am I bringing it up? Well, probably just because that’s the name of this post. And also because I really want some. Well, if you ask me [not that anyone did], I think that simplicity is often best in most things, from how you take your coffee to the clothing you wear. And Bublee Bing proved me right again with this sweet little number. The Lagerfeld, inspired by none other than Mr. Karl Lagerfeld. What you see is what you get with this adorable little dress. Swishy skirt, rose brooch, and then that big hair bow to just top off your look. The moment I saw it, I fell in love! Simple, elegant, and yet still fun. Just the way it should be. Pick yours up at Bublee Bing! Today’s Gaze – Old, New, and Funky Junk, too! Oh, I just adore autumn fashion! The best part is digging down deep into my inventory closet and finding those items I just loved last year and mixing them up with new things! This simply precious Usakko knitted jacket from Bare Rose has been one of my favorites since I received it as a Christmas present. Beautiful quality, and naturally it is extremely affordable, at just $170L for 5 colors of the jacket, plus some little shorts and a shirt. You can’t see it, but there are 2 hood options, plain and with bunny ears! It’s also transferable, which is something I just adore about Bare Rose. If you want it and are very pressed for time [because let’s face it, we all know how huge the store is! ], check out their website. You can pop in the name of whatever you’re looking for and it’ll give you a direct teleport link. Nice! Of course, you do have to mix old and new together to make wonderful, so I’m wearing the Sabrina hair by Truth Hawks, which was just released today. This hair reminds me JUST of how my mom would do my hair when I was 6 years old! Squee!! The little “gumball” hairband is color change, but there is a “plain” version available, if you just don’t want to be TOO terribly cute. Oh, what? You’re asking what I’m standing in front of? Well, that would be The Barn, soon to be released by Funky Junk. Check it out, it’s HUGE! It’s really cool! There is a ladder and a couple of stalls inside, too. You know, just in case you have horses or…something farmy. The Barn is great for your animals, but you could easily live in it yourself, it’s that cute! Funky Junk does not have an in world store yet, but if you’d like to see a demo, you can contact creator Ulaa Coronet. Or just ask me. I’m spoiled and have all the items. 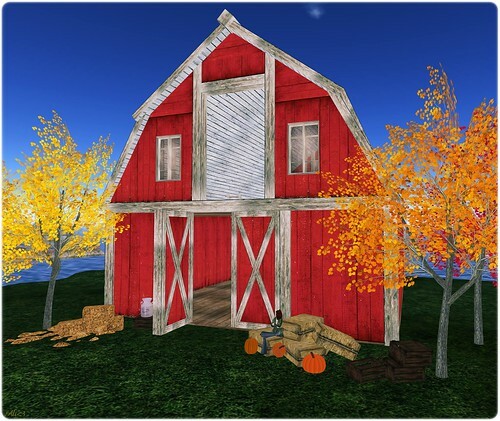 The Barn is not yet available for purchase, but should be either later today or Friday. More from Wear Gray, which starts on Sunday. This time from the wonderful store of Elymode! I’m wearing the Joelle outfit in purple and black. I love it! I’m a huge fan of separates, so I know that the pants, top, and shrug will definitely be getting some use in my wardrobe. With stores like Elymode, Wear Gray is certainly shaping up into a very fabulous and fashionable event!! Wear Gray Starts This Weekend! The Wear Gray fair is starting on September 12th! Wear Gray is a gathering of SL designers from across the grid of all styles and genres, coming together for two weeks of fundraising to raise funds to go towards the American Brain Tumor Association to aide in the awareness, research and help for those that suffer from brain tumours/cancer. For more information about them you can visit The American Brain Tumor Association website. Over the next two weeks, I’ll be bringing you some of the great items you can purchase for a worthy cause, like this adorable outfit from Izzie’s! This is called Wear Black/White and I just think it’s adorable! It come with both pants and shorts options, along with the short jacket, tank and toeless socks I’m wearing in the picture. So cute! I had never heard of Izzie’s before this, but you can be sure I’ll be hitting up their booth at Wear Gray! If you have any other questions concerning Wear Gray, feel free to get in touch with Sanura Snowpaw, Wear Gray director. And I hope to see you out there from 8pm-10pm SLT on the 12th, as I’ll be DJing for the event at that time! Shake your body like a belly dancer! A few years ago, I used to take belly dance classes. It was something I deeply enjoyed and I would suggest that any woman, of any size, do belly dance for at least a month. Nothing will make you feel better and more at home in your body. I am hoping to begin classes again within the next couple of months! That being said, when Angelwing put out their new Coin Silks, I immediately got into the belly dance mood! They are simply amazing! Look look look! Most of the “coins” you see in Second Life are just pictures of coins on alpha textures. Not these! Oh no, honey. You will be rockin’ out with about 1400 prims when you wear this outfit! Earrings, anklets, bracelets, belts…all prim, and all wonderful. The outfit also comes with harem pants, if you choose not wear the skirt. If you wear the pants, you better wax, because they are low low low in the front. There is a “higher” option as well, which is what I wear when I wear the pants. The skirt also looks really good with the pants, if you are on the more modest side, or just want a different option. The Coin Silks are shown here in Aqua, and come in other colors as well. I have a feeling I’ll be getting a lot of use out of just the jewelry because it’s pretty awesome. Go pick yours up at Angelwing! Oktoberfest starts on September 18th, and just in time, Bublee Bing has released new Dirndls! These dirndls are just too cute! If you do any kind of roleplaying in SL, or you just enjoy dressing up in costumes, you kind of need these! They come in all kinds of colors and there is an option for the married and unmarried apron. Last year I wore the unmarried one, but I’m partnered this year, so I switched! There is a 50% off sale on all of last year’s dirndls, which are just as awesome as the new ones, so if you want to play in SL but don’t want to spend a huge amount [costumes can get kind of pricy], then be sure to hit up the sale at Bublee Bing! Time for the Plurky Bloggers challenge – week 2!! Hexed by Kya Eliot was one of those shops that the moment I walked into it, I fell in love with it. Kya had everything from pretty preppy clothes to more gothic attire to costumes to boots. Her textures were top notch and her prices were awesome. This dress, Patches, is the last thing I remember getting from Hexed, and that was well over a year ago. Kya’s profile says that she’s closed and looking for better high speed internet. Let’s hope she finds it and comes back to us one day. My hair is from the much missed Frangipani. It was always a bit of a mystery to me why Frangipani closed down. For a while there was a huge sale, and man, did I buy buy buy! Hair and clothes…mine mine mine. Then there was a new location, a new build, a few new releases, and then…a quiet goodbye. Heck, it wasn’t even goodbye. It was more like “Where did they GO?” Designer Rach Snookums’s profile holds no clues. If anyone knows why, I’d love to know! My skin is the first release from Free Speerit, back in 2008. This is Desidelia in Smokey Green. My boyfriend at the time bought me fatpacks for our one month anniversary, and I wore the HECK out of these skins. I miss you, Desi!! My necklace and ring are from very much missed ~flirt~. I had the joy of having designer Skinkie Winkler living on my island for a few months and I loved to see her little green dot on the map. I just knew she was creating wonderfulness above my head. Skinkie was probably one of the best prim torturers I’ve ever had the pleasure of meeting, and I hope the physical world she left us for is bringing her much happiness and love. The shoes on my feet are the cute Starley pumps by ever so much missed ETD. I’ve heard that Elika has been seen out and about in SL recently, and that she has a new sim, so I’m keeping my fingers triple crossed that she’s embarking on a new project to put goodies on my head and pretties on my feet. Of course I’m wearing eyes by Miriel. I mean, how could I not? I’m standing in front of a house by O-Magine, which closed a while ago, but you can still find their old homes on XStreet. I wish they’d do new stuff. The builds have all been wonderful. And my pose is by Striking Poses, which I don’t believe updates any more, but is still somewhere hiding in SL. Wow, sorry this is so long winded! I am most definitely in full on autumn mode! But in my neck of the woods, it’s actually still pretty warm. Betty Doyle of Ingenue just released these wonderful Falling Autumn outfits, and these definitely give us the opportunity to enjoy autumn clothing without getting too hot. Such an adorable jumpsuit! The long skinny jeans give you legs for days, and that knitted cowl is just too too wonderful! It would also be easy to pair up the jumpsuit with a sweater, or wear the cowl with just about anything. Love! Falling Autumn is available in 5 colors and can be found at the Ingenue mainstore.